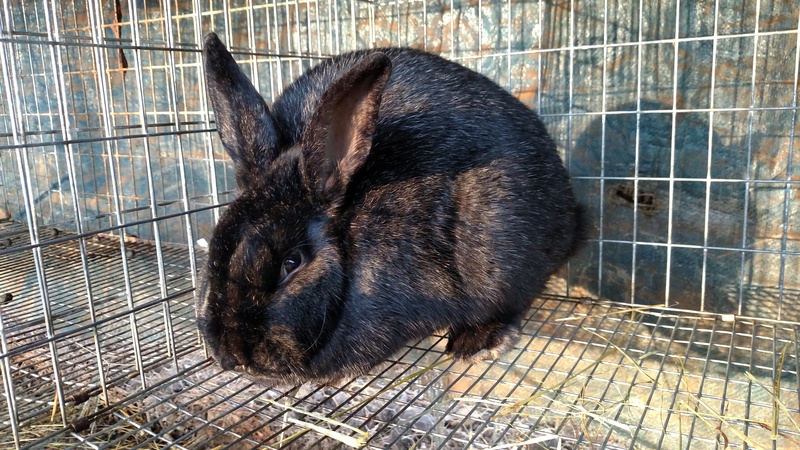 If you’ve visited the homestead in the last few months, you may have seen or heard about the yard rabbit! 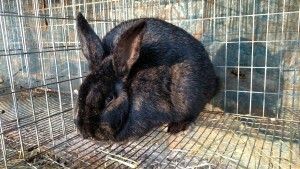 This is one of our silver fox rabbits that escaped from a rabbit tractor. Well, truth be told, this was quite the Houdini of rabbits. We first moved this rabbit and its littermates out to a tractor at 6 weeks of age, which is when we typically move rabbit kits to the tractor. At this age they’re (usually!) large enough not to escape through the wire, but young enough to maximize their time being grass-fed. Shortly after moving this litter to the rabbit tractor, this Houdini rabbit escaped! We caught her and put her back in the tractor, figuring she had just been lucky. Within a day she escaped again, proving us wrong. 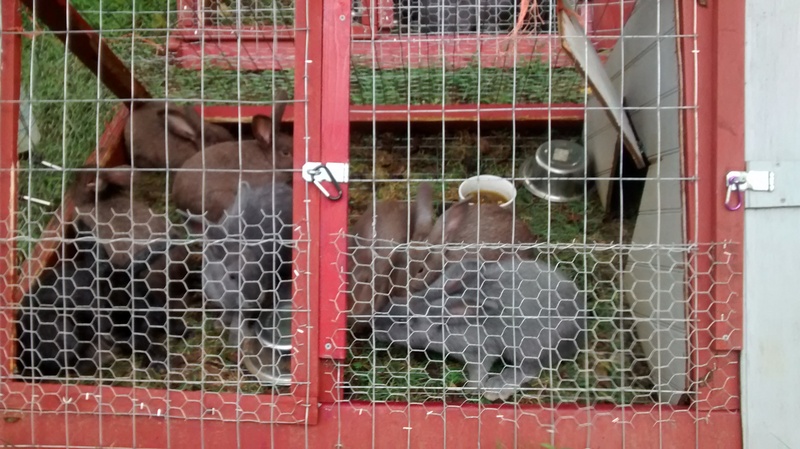 At this point, we moved the entire litter back to a traditional rabbit cage, thinking that maybe they were still too small for a tractor. 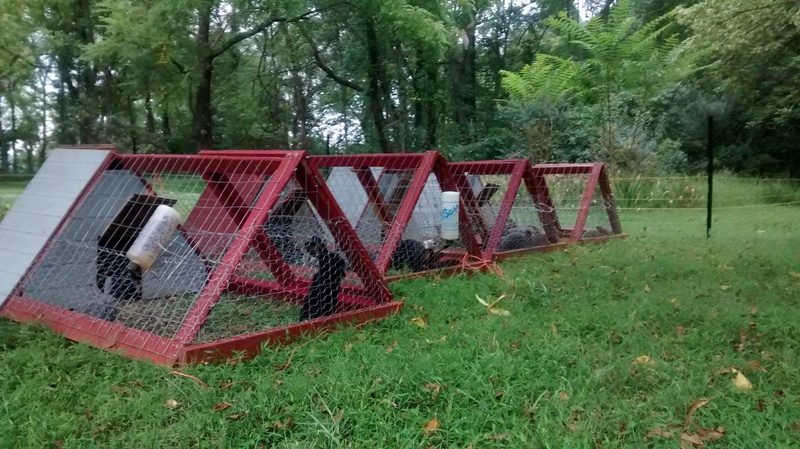 After living in a rabbit cage for 2 more weeks, we moved the litter into a rabbit tractor again. They surely must be large enough to stay in the cage this time! 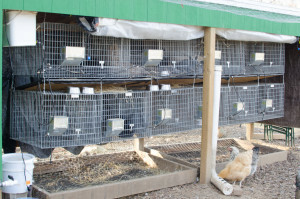 After all, dozens of other rabbit litters have used the cage with no problems. Right…. Within a day or two, Houdini rabbit had escaped…. again. She was older and wiser now, too, which made it impossible to catch her! She was small enough to fit through the holes in the lattice that shield the area under the porch. So when we’d try to catch her, she’d just run through the lattice under the porch. Why didn’t we just put one person under the porch to catch her, you ask? Well, she’d do to the area under the porch where a person couldn’t fit! She’s a smart rabbit, this one. Finally, we resigned ourselves to the fact that Houdini rabbit was going to be Yard Rabbit. If you keep enough rabbits for enough time, it seems inevitable. We had heard of other rabbit breeders and their yard rabbit adventures, and were simply thankful that we were able to go so long without our own escapee. As time went on, Yard Rabbit provided us much entertainment. She’d visit the rabbits in the tractors, eating the grass just outside the tractor. When we’d come out to feed the rabbits, Yard Rabbit would hop just far enough away to stay out of reach. When we put away the rabbit tractors for winter, Yard Rabbit started living by the woodpile, and visiting the goat pen. We’d see her hopping around when we fed the goats in the morning. If a few days went by without a Yard Rabbit sighting, we’d worry about her until we saw her again. One day Yard Rabbit ventured as far as the rabbit hoophouse on the back part of the property. The first time we saw her there, we worried one of the rabbits had escaped its cage! We couldn’t believe Yard Rabbit had gone so far, and seemed to sense other rabbits were living there. Last Sunday, Yard Rabbit was visiting the rabbits in the rabbit hoophouse again. We spied her through the kitchen window. Harley realized if Yard Rabbit was to go inside the chicken yard, which is very close to the rabbit hoophouse, we’d be able to trap her in there! 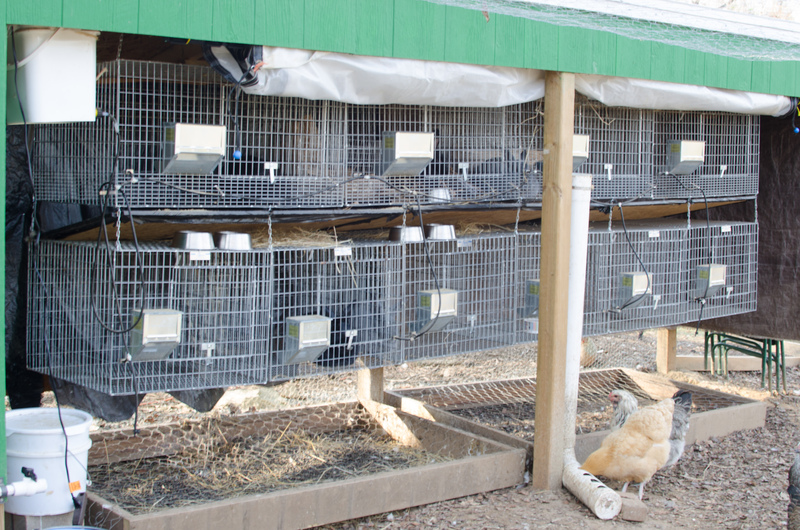 The chicken yard is enclosed by chicken wire, so if we closed the door after Yard Rabbit entered, she wouldn’t be able to get out. Harley ran out there, just in case Yard Rabbit went in the chicken yard. It was our lucky day, because Yard Rabbit hopped right into the chicken yard! Harley quickly entered the chicken yard and shut the door behind him. A spirited rabbit chase ensued, in which the fact that rabbits are pretty darn fast was reinforced. Harley decided to outsmart the rabbit, since he wasn’t going to outrun it. He set up a live trap, placing it against the fence of the chicken yard in a “choke point” location where as the rabbit ran along the fence, it would run into the trap. Sure enough, Yard Rabbit ran right in and was trapped! So Yard Rabbit is in the yard no more. In this picture you can see the effect of her being wild for so long: she is very tense here, not used to being in a cage and so near humans. Seeing her demeanor highlights how tame and docile our other rabbits are! The Yard Rabbit Adventure was an interesting experience. 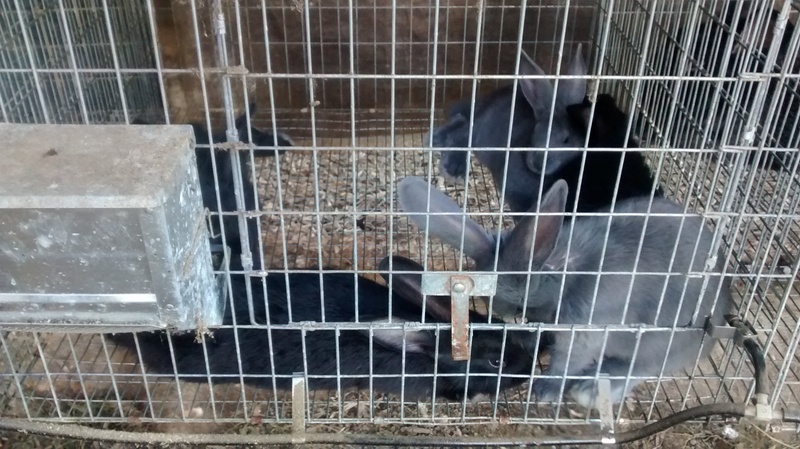 We learned that these rabbits still have survival skills, even after being kept in domesticity for so long. We also enjoyed seeing Yard Rabbit hopping around, and seeing where she’d turn up next. Even so, we are happy that she is safe and sound under our protection once more.